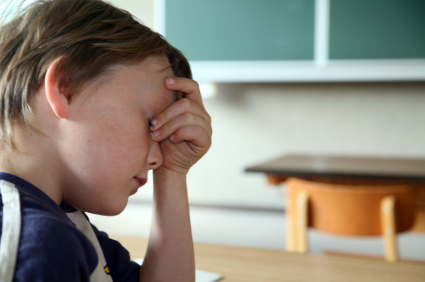 Yet another attempt at injecting prayer into public schools has been challenged, this time in the U.S. city of Baltimore. Perhaps more unsettling than this is the fact that the president of the city principals’ union has defended the prayer services, lamenting the fact that public school prayers have been banned in the United States since the 1960s. 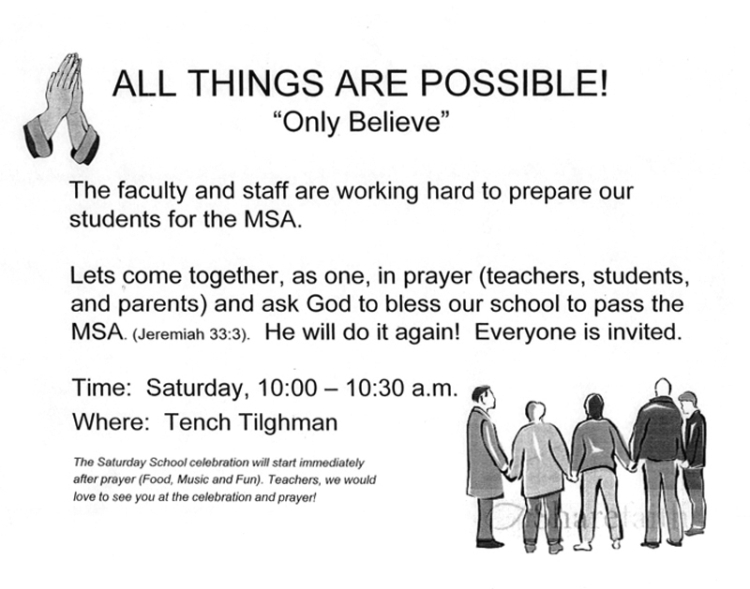 The prayers services in question have been held for two years at northeast Baltimore’s Tench Tilghman Elementary and Middle School in preparation for the standardized Maryland School Assessments. In response to requests by local parents, the school has been distributing among staff fliers which promote prayer and cite Christian Bible verses. Staff were then asked to circulate them among the school’s four hundred students. The principals’ union president, Jimmy Gittings, has defended the school’s principal, Jael Yon, who has been facilitating the flier distribution. The only individuals I hold accountable for these injustices for Ms. Yon are the narrow-minded politicians from some 50 years ago, for removing prayer from our schools. Once prayer was removed from our schools, the respect for our teachers and administrators has been increasingly out of control. It is ironic that Gittings should call the judges who ruled against public school prayer “narrow-minded”. The whole point of those rulings was to prevent the government from endorsing one particular religious perspective over all others. Clearly, then, they were showing the importance of neutrality and open-mindedness; the only thing they were narrow-minded towards was religious bigotry. It is the supporters of state-sponsored public school prayer who are promoting a single perspective—one based on the Christian faith tradition. They are not defending or promoting all religious perspectives. Such exclusivist theology hardly reflects open-mindedness. In addition to this unfair ascription of narrow-mindedness, Gittings makes an unsupported claim associating lack of public school prayer with increased unruliness among pupils. When a person makes a claim that A causes B, they must be able to provide evidence showing how A causes B. It is not sufficient simply to say that there is a causal relationship between the two variables. Gittings suggests that student unruliness is caused by a lack of public school prayer, yet he fails to provide any reasoning or evidence to support such a fantastic claim. There could be myriad other socioeconomic factors contributing to student unruliness—it is neither necessary nor sufficient to attribute their rebelliousness to prayerlessness. Gittings’s attempt at defending Yon turns rather desperate. Referring to Yon’s conduct, he states she “was doing what she thought was right”. That may be so, but it still does not mean that what she did was right. Good intentions do not equate with good actions. As if grasping for straws, he then dismisses the whole question surrounding the constitutionality of state-sponsored public school prayer as if it is of no consequence. According to Erica L. Green of The Baltimore Sun, he “said he was aware that it wasn’t constitutional, but he still believed in the message”. Unfortunately, belief proves nothing, no matter how passionately one stresses their attachment to it, and, unfortunately, the “message” of which Gittings speaks has conflicted with constitutional law on a regular basis for decades. Stressing “belief” in some nebulous “message”—despite the fact that courts have ruled it unconstitutional for decades now—is not a very persuasive argument, unless you’re a sucker for queasy sentiment. Now that the Christian prayer services being held at Tench Tilghman have been brought to public attention, advocacy groups such as the American Civil Liberties Union will have the opportunity to challenge them in court. If the Establishment Clause of the First Amendment to the United States Constitution can be interpreted by judges to mean that the state shall not endorse any religion (as it has been for decades now), one can wager the current practice at Tilghman will be abolished, and we will be able to nurture greater equanimity in our children without unnecessarily turning it into a religious thing.